The Victory leather agitation harness has a Y-shaped breastplate that diverts force away from a dog’s throat onto its shoulders. The harness's breast plate is made from heavy-duty leather, and is lined with thick felt for shock absorption. The straps are secured to the breast plate with stitching,brass rivets and leather loops. This dog chest harness was designed for agitation work, but is comfortable for everyday-use as well. 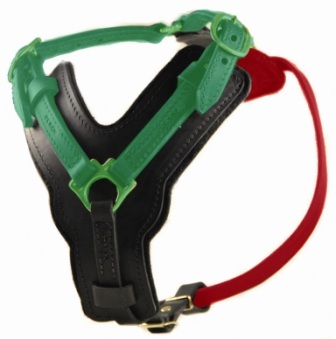 Add a No-Pull D-Ring to front chest strap to discourage your dog from pulling. This agitation harness comes with an optional handle for an extra charge. In these days of plastic, faux leather, and ever-diminishing standards, I was quite impressed by the Victory harness which was on Amazon. However, as beautiful as the picture was, I had no inkling that the harness would be of such high quality and so impressive. It's heavyweight leather and fine details make this harness stand out above any other. It is obvious that careful attention was given to each facet of its design, and it has an old-world look and feel. It is classy without being ostentatious, and It looks just fantastic on my pit bull rescue. It goes wonderfully with his lighter brown coat, and he is very proud to be seen in it. If I ever need anything else, I will be back. And I tell everyone who asks me who made it. I wish your company well and may you continue to thrive and prosper. Since larger sizes run in my Great Dane's family I called Dean and Tyler and they helped me out customizing my boy's harness. It's a very good and classy looking harness. The customer services was hands down the best I've seen in this business compared to competitors that do this in the US. Outstanding job Dean and Tyler!! It was beautiful and very well made but too big for my boy. I had to return it. The harness was delivered on time in a caring cotton string tie bag, which was nice and the real leather smell was cool. ten out of ten!!! !